Thursday October 28th 1881 I helped with the work this morning for Bridget was washing. I went over town in the afternoon, did a little trading and went down to Hatts to bring May home with me. I came up with Hatt to look at the place they are to buy and we came on down to Hornes and got us a new heavy cloak just alike. I practiced in the evening. 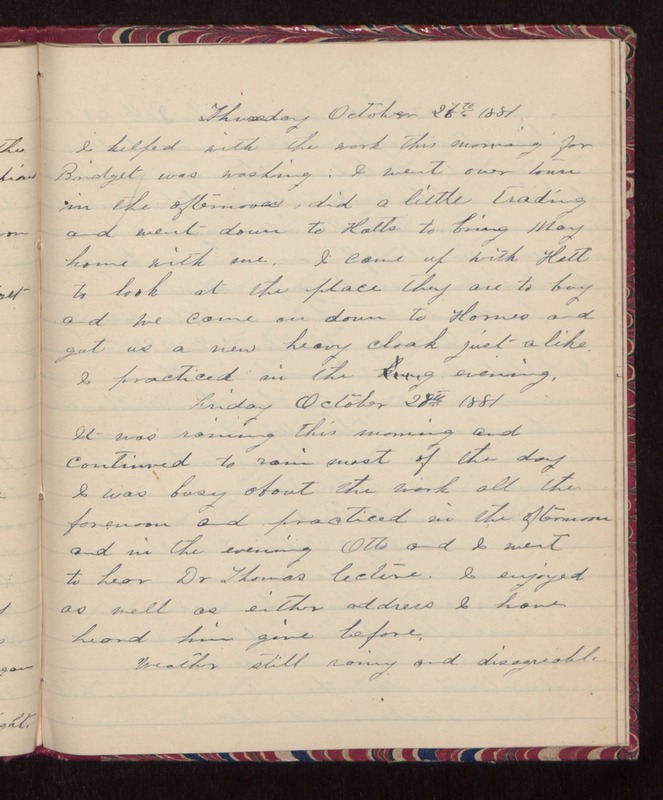 Friday October 29th 1881 It was raining this morning and continued to rain most of the day. I was busy about the work all the forenoon and practiced in the afternoon and in the evening Otto and I went to hear Dr Thomas lecture. I enjoyed as well as either address I have heard him give before. Weather still rainy and disagreeable.